Crossout update 1.49 on PS4 is now available for players. According to the official Crossout 1.49 patch notes, the new Snowstorm update comes with “Christmas Heist” event. In this new event, players have to fend off the incessant squads of henchmen and protect the Christmas tree. 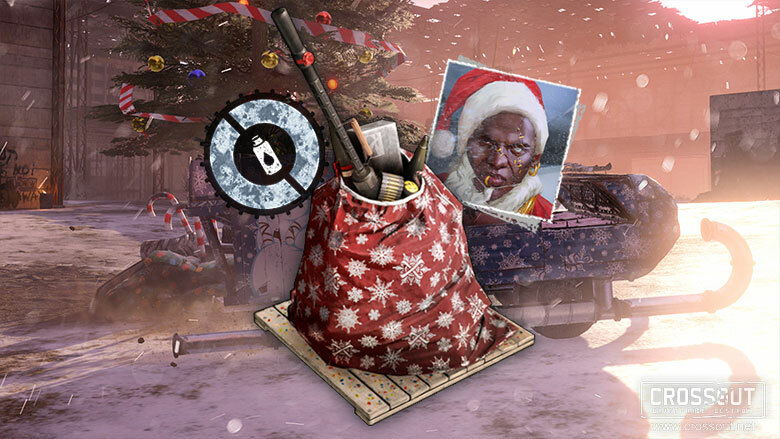 Teams of the most resistant and stubborn defenders will receive unique New Year’s gifts. Players will also get special challenges in the brawl and a festive sticker and a memorable portrait. In addition, the latest Crossout version 1.49 also includes stability and performance improvements. Recently, an update was released with gameplay changes and improvements. Unfortunately, since the last patch, many players are experiencing a number of issues when trying to play the game. Today’s Crossout patch 1.49 is expected to fix all these issues. Check out more details below. “Christmas Heist” is a PvE brawl that will take place in the zone “Sector EX” covered in ice. The brawl is available from level 4 of Engineers faction. Players take part in the battle in a team of 4 people (including the player himself). The task is to hold out as long as possible against a huge army of Gronch’s followers. At the end of the first battle, all team members enter the leaderboard. If the player manages to exceed his previous result in subsequent attempts, then his best score in the leaderboard is updated. A player does not have to try to improve his position with the same team. He can either assemble a new group or try his luck as part of a randomly selected team. During the “Snowstorm” event, the brawl will replace all other brawls, with the exception of “Battle Royale”. Battle Royale will be launched according to its usual schedule and will be active on Saturdays and Sundays along with the “Christmas Heist”. Those defenders who occupy places 1 through 1000 on the leaderboard at the end of the event will receive a unique decor of legendary rarity “Confetti Box”. Those defenders who occupy places from 1 to 100 in the leaderboard at the end of the event will also receive the “New Year’s flare” of legendary rarity. When activated, releases a pyrotechnic fountain, fire and sparks. All defenders who were able to deal with 10 waves of enemies receive a unique “rare” sticker “New Year’s Defender”. All defenders who were able to deal with 30 waves of enemies receive a unique portrait “Fireman Henry”. Attention, everybody! The festive “Bureau of explosive finds” is open for business once again! Christmas souvenirs for your metal companion for every taste and colour! Take part in the special “New Year’s fever” mission, get “Crackers” and exchange them and other resources for whatever you like the most! “Crackers” is a temporary holiday resource. When the “Snowstorm” event is concluded, all unused “Crackers” will be removed from the game without the possibility of exchanging them for any resources. “Crackers” will be available in the special New Year’s Fever PvP mission. “Crackers” is a non-tradable resource. “Crackers” along with other resources can be exchanged for Christmas decorations, stickers, fireworks and paint cans at a special workbench “Bureau of explosive finds”. 450 units of scrap metal. Increases combat reputation gain by 3%. 250 units of scrap metal. Increases combat reputation gain by 4%. 100 units of scrap metal. Stickers of common rarity: “Festive Avenger”, “Happy Snowflake”, “Deer Counter”, “Happy New Year!”, “Bow”. 150 units of scrap metal. “Rare” stickers: “Snowhand”, “Rileyberg”, “Snowdegon”, “Stocking with gifts”, “Snowman AB”, “Snowman Pete”, “Snowman”, “Snowman XO”. Stickers of epic rarity: “Cookie”, “Croissant”, “Boom, and you win!”, “Croup”. “Rare” fireworks: “Red Fireworks”, “Green Fireworks”, “Blue Fireworks”. 200 units of scrap metal. Fireworks of epic rarity “Fireworks volley”. 300 units of scrap metal. Fireworks of legendary rarity “Crossout fireworks”. 400 units of scrap metal. The selection is truly huge. Can you collect everything? It’s time to find out! Gerda and Kai just love the winter holidays, because it was winter many years ago when they truly believed in miracles. Their home village was doomed to a freezing death by a raider leader, nicknamed the Snow Queen, and only the brother and sister managed to survive. Saved by Odegon, Gerda and Kai became loyal Firestarters and since then every winter they make sure that no one suffers the fate of their family. Some say their fireworks burn… but can there be too much fire? Please note that the pack will be available for purchase until January 14! Winter holidays are a time when everyone becomes a little kinder, gives each other presents, decorates trees… but not him. Gronch goes on the warpath. His enemy is the very spirit of the holiday, and no one risks to ask how it happened. Most know nothing about Gronch except that he hates the winter holidays. Rumour has it that Gronch got his terrible scars in the New Year, but there is no evidence of this. Only one thing is certain: in his battle against the holiday, he will stop at nothing. Now, in the event of an incorrect connection of players from one of the teams, the battle ends automatically. In this case, none of the teams get a win, loss or draw. Kapkan mines placed under water can now be destroyed from a close distance. In all PvP missions and raids, the locations of ally deaths are now indicated by special icons on the map and the battle screen. The option “Mini-map scale” added the ability to change scale to 1.5 and 1 (increasing the area of the location displayed on the mini-map). The menu for exchanging badges for resources and containers can now be opened straight from the storage. To do this, right-click on the resource / container in the warehouse and select “Build”. Rarity of the paint “Wood grain” has been changed from epic to relic. Collision model of the part “Train plow” has been improved. Improved collision model for the cabin “Ghost”. Added an explosion effect when a projectile hits a wooden surface. Improved display of attachment points on the bottom of the “Bear” cabin. Part category for “Round Stop Light”, “Stop Light” and “Taillight” has been changed from “Decoration” to “Stop Light”. Now all wheels are divided into three categories: light, medium and heavy. The icons of the turrets in the “Steel Cradle” raid have been improved. Fixed a bug with the imposition of a grid of coordinates in the “Battle Royale” brawl. A number of objects and their collision models in the Bloody Rocks zone in the Battle Royale mode have been improved. Fixed a bug with incorrect spawn point on the “Factory” location in the “Steel Cradle” raid. Fixed a bug where the “Werewolf” drone exploded after spawning, if the cabin’s self-destruct key was pressed at the time of the drone’s explosion. Fixed incorrect positioning of graffiti on objects in “Sector EX”. Fixed a bug with the imposition of the motion effect on the “Starter wheel” part. Fixed a bug with overlapping of the elements of the checkpoint and the building in “Race” mode on the “Factory” location. Fixed a bug where on a number of maps it was possible to be on an invisible platform above the location. Fixed a bug related to incorrect speed of turning in place of armored vehicles with tracks. Fixed a bug with the pulse when the harpoon cable was detached from drones leading to their falling under the ground. Fixed a bug with incorrect vehicle link operation at the exhibition. Fixed a bug with the gate explosion effect in the raid “Perimeter Breach”. Fixed a bug where a player in the Storm Warning brawl could appear directly behind his opponent. Fixed crashing issues with Crossout 1.49. Crossout version 1.49 has added fixes for glitches. Added performance and stability improvements with Crossout 1.49. Crossout update 1.49 is now available for download on PlayStation 4.